What counts as ESG success in infrastructure? Part of the beauty of investing in infrastructure is the sheer variety of assets that you can be involved with: an airport in the UK one week, a solar plant in North Africa the next. However, this variety of different types of assets can create headaches when it comes to determine success in any other terms beyond financial returns for investors. This is a problem, as the Environmental, Social and Corporate Governance (ESG) values of investors such as pension funds play an increasingly important role in the way funds and assets are managed. A poll of the audience at the Infrastructure Investor Global Summit in Berlin found that for 74% ESG was an important part of their business model. In addition to the problem caused by the variety of infrastructure assets, the differing values of different investors also makes it difficult to apply any standard model of success for the ESG profiles investments. “It’s very difficult to meet all the expectations of all the investors all the time,” said IFM Investors Executive Director Annabel Wiscarson, speaking at the event in Berlin. In an ideal world, there would be some universal standardised measure for ESG success, such as “impact points”, suggested Martin Ewald, Allianz Global Investors Head of Investment Strategy for Infrastructure Equity. However, “in the absence of a unified standard, you have to choose your areas [that count as ESG success] and integrate that into your decision-making”. Ideally, reporting ESG successes should be integrated with any communications about returns because, said Wiscarson, “there isn’t a trade-off” between good ESG and good asset management. “Doing the right thing over the long term equals better returns, and that’s how pension funds see it too,” she said. Wiscarson used the example of IFM’s investment in UK water company Anglian Water to illustrate how good ESG and great returns go hand-in-hand. “The company is talking a lot about sustainability actions,” she said. One of the biggest criticisms of renewable energy made by its opponents is that it is inefficient and can only survive when supported by government subsidies such as feed-in tariffs and tax breaks. Thanks to ever-improving technology and the rapidly falling cost of wind and solar power, this argument against renewables looks increasingly weak. Speaking at Infrastructure Investor Global Summit in Berlin, Starwood Energy’s senior managing director, Bradford Nordholm said market forces, rather than government policies, were now the driving force behind renewable energy investment in many parts of the US. “In the right location with the right resources, and despite cheap natural gas keeping electricity prices low, we have seen wind and solar achieve grid parity on wholesale prices, not just retail prices,” said Nordholm. Nordholm’s comments echo research by Macquarie,, which estimates that, by the early part of the next decade, unsubsidised wind will be more competitive than a combined cycle gas turbine plant in the US. Speaking alongside Nordholm on a panel discussing the future of renewable energy at the Infrastructure Investor Global Summit, Dan Wells, partner at Foresight Group, said that market forces were so influential now that they rendered “irrelevant” legislation like President Obama’s Clean Power Plan (currently embroiled in legal challenges and unlikely to be defended in court by President Trump). Renewable energy’s trend towards electricity price parity with traditional forms of electricity generation is not isolated to the US. According to Macquarie, in markets including Germany, Spain, Italy and Japan, rooftop solar is expected to reach wholesale electricity price parity between 2018 and 2020. In part in response to this trend, and in part a result of tightening fiscal budgets, this has meant in many countries a move away from flat subsidies to more market-based mechanisms for support of renewables, such as auctions. For investors in new renewable energy project, said NTR CEO Rosheen McGuckian, this meant there was a need to get involved with greenfield schemes at an earlier stage, to make sure you back a winner. “We are moving more towards auction-based systems,” said McGuckian. Rather than being put off by the gradual removal of generous long-term subsidies, investor appetite for renewables continues to grow. In 2015, for the first time ever, more money was invested in new renewable electricity generation than in new fossil fuel-based power plants. A study by the Frankfurt School of Finance and Management for the UN Environment Programme found that the $286 billion invested in renewables in 2015 was more than twice that invested in gas and coal-fired plants. A poll at the Infrastructure Investor Global Summit found that despite the lessening of the subsidies and the disruption that renewables causes for the grid and other power technologies, 76% of investors in the audience were allocating more funds to the energy sector. As well as renewables increasing price competiveness and a proven track record of returns, another factor that continues to drive investor appetite for renewables are the environmental, social and corporate governance (ESG) concerns among many limited partner (LP) investors around climate change. “The LPs have been phenomenal in driving implementation of ESG standards out to General Partners (GPs),” said Denham Capital director Jens Thomassen, also speaking in Berlin. What kind of future are we building for? A big part of infrastructure’s charm for investors is that it is an asset class characterised by long-term investments. But in a world of rapid technological change, how possible – or indeed sensible – is it to invest in and build expensive power plants or rail lines that could be rendered redundant before the end of their 25-year terms? Just how radically the world could change in the 21st century was highlighted at the Infrastructure Investor Global Summit in Berlin by bestselling author Professor Yuval Noah Harari, from the Hebrew University of Jerusalem. Harari’s latest book, Homo Deus: A Brief History Of Tomorrow, outlines how technology could give us the ability to extend lifespans and even cheat death, the capability to become “Gods” as we create new life forms. “Science is ushering in a new era where natural evolution may be replaced by intelligent design,” said Harari, speaking at the event in Berlin. Thanks to artificial intelligence (AI) “life may spread out of organic compounds into the inorganic realm”. With great power comes great responsibility. Harari said that civilisation stood at a crossroads, and that a coherent vision of how society would operate in a world of driverless cars, AI robots and potentially billions of unemployed. Unfortunately, just as governments had little to do with the advent of the internet, neither are they providing a compelling vision of the future. “Almost all political systems are unable to cope with the rapid pace of change,” said Harari. The only place providing any kind of coherent vision of the future is Silicon Valley, which was a problem, said Harari, as it placed a lot of power in the hands of a very small group of people. “If you want a vision of the future, then you speak to Elon Musk and Mark Zuckerberg,” said Harari. A vision was necessary, added Harari, because visions determine what you do with technology. “Technology opens a lot of opportunities, but it is never deterministic,” he said. To be optimistic about civilisation’s ability to adapt to the shock of AI and automation, Harari suggested looking at where humanity stood today. Within this universal world, Harari agreed with a statement made by Robin Chase, co-founder of Zipcar and Veniam, earlier at the conference that “Infrastructure is destiny”. But Harari urged the audience to stop thinking of infrastructure as purely external assets, saying that the smart roads or sewers of the future could have the power to connect with us internally, interacting with internal biometric sensors. It opens up tantalising possibilities of roads knowing we will travel on them before we do, and wastewater systems that are on alert before you flush the toilet. GM has predicted that autonomous vehicles will be available to buy as early as 2020, if not sooner. For an industry like infrastructure investment, where 15-20 year contracts are standard practice, this is no time at all to get ready for what amounts to a revolution in the transport sector. In fact you could say the future has already arrived - Google’s driverless cars have already passed 2 million miles of driving on US roads and, according to Robin Chase, co-founder of Zipcar and Veniam, mass adoption of these vehicles could take place in as little as five years, driven by the economics of city-living. Speaking at the Infrastructure Investor Global Summit in Berlin, Chase said that as long as the advance of driverless cars coincided with mass adoption of lift-sharing and the cars are electric, the landscapes of our cities could be radically transformed. “In Houston, for example, 65% of the city is dedicated to off-street parking,” said Chase. “Just think of the investment potential and the land use potential when you stop using cars [for one-person journeys].”. In Chase’s view there are two reasons why driverless cars could, and should, free up both congestion and car parking spaces in cities. The first reason is the adoption of lift-sharing. GM has invested $500 million in car-sharing app Lyft, while the potential for driverless vehicles to be available “on-demand” via apps like Uber means car ownership is predicted to drop by as much as 43%. The second reason is that there is little reason for driverless cars to park in city centres, if at all. “When you take the [taxi] driver out of the vehicle, the cost of running that vehicle goes down to $2 per hour,” she said. Whether the cars are constantly moving, or go to park somewhere cheaper outside the city centre, the end result of both this and the rise in car-sharing would be fewer cars on the roads, and less need for car parks, such as those that dominate two-thirds of Houston, Texas. “When you go down to 10% of the fleet there will be less parking and it wont need to be done at the most expensive retail space in town,” said Chase. Bad news if you have invested heavily into parking concessions. The fact that technologies such as autonomous vehicles will inflict significant upheaval on the infrastructure investment community was acknowledged by Arcus Infrastructure Partners co-managing partner Simon Gray, also speaking at the event in Berlin. Along with the revolution for the energy sector coming from new storage technologies, Gray said transport investors knew they were in for a bumpy ride. “Clearly there’s going to be a lot of disruption in the energy and transport space,” said Gray. However, while there may be losers like car park concessionaires, some existing transport modes will remain: Chase said she predicted there would continue to be a need for mass transit services like buses and trains in major cities. Equally, there may also be winners as driverless technology opens up new infrastructure opportunities, particularly where roads are concerned. Although Google may claim its cars’ sensors and onboard artificial intelligence (AI) will be sufficient for the vehicles to navigate existing roads, researchers elsewhere argue that driverless cars will be entirely dependent on the “ecosystem” they operate in. The University of Michigan has built an entire town, Mcity, just to test autonomous vehicles. The town comprises different kinds of road surfaces, different kinds of road signs and lines, various types of traffic signals, highway conditions, and urban conditions. So far the University’s work with 3M at Mcity has shown driverless vehicles hugely dependent on information they receive from supporting local infrastructure to successfully navigate differing road conditions. Rather than mere strips of tarmac with toll booths, roads are likely to become far more complex assets, and therefore even more likely to require the private sector expertise that infrastructure investors can bring. What global trend has infrastructure investors more worried than any other? The answer from the first morning of the Infrastructure Investor Global Summit in Berlin was clear: protectionism. A poll of the audience found that 36% considered rising global protectionism as the biggest risk to private investment in infrastructure assets. US president Donald Trump has vowed to put “America First” and threatened protectionist policies such as trade tariffs. Speakers at the event in Berlin believed that the rise of populist politics seen with the election of Trump and the UK Brexit vote to leave the EU – and the social media platforms used to spread it - meant business-as-usual was no longer an option for infrastructure projects. In particular, many of those speaking at the event believed that improving community engagement and winning the public over was crucial. For Meridiam Infrastructure Founding Partner & CEO Thierry Déau, speaking at the event in Berlin, the level of engagement required could even mean changing the structures of deals. “In the aftermath of a lot of populism and angry reaction from the public, I think the way of engaging in public infrastructure will have to be modified one way or another,” said Déau . Having the buy-in from the local community was crucial, said Déau, and that extended to allowing their input on how assets are financed. “You do have to engage people at the outset,” he said. Indeed, while the majority of the public support investment in infrastructure in general, InstarAGF Asset Management President & CEO Gregory Smith said those building and investing in projects still need to secure a “social licence for infrastructure”. “Sixty per cent of people support private investment,” said Smith. That support is built up, said Déau, through strong community engagement both on the ground and on social media. “For example a simple solar plant in Senegal, we really worked at engaging and educating communities, helping young people,” he said. Investors’ involvements in assets that many consider public goods – such as roads and bridges – meant that they could expect to experience ever greater levels of scrutiny in the age of social media and populism, Graeme Conway, Head of Macquarie Infrastructure and Real Assets, Americas. The way for investors to combat this was to clearly demonstrate the value they add. For Conway, this could be through the provision of transformative technology. However, for Global Infrastructure Partners Chairman & Managing Partner Adebayo Ogunlesi, success in avoiding populists’ wrath could simply be achieved by good old-fashioned customer service. “At the end of the day, the best protection against adverse government action is providing quality services,” said Ogunlesi. Speaking specifically about the US - where Ogunlesi has been appointed to President Trump’s Strategic and Policy Forum charged with advising the president on economic matters – he said that public engagement included the need for greater education on the benefits of private investment and ownership of infrastructure assets. “There needs to be greater demand for higher quality service,” he said. The reason is the majority of airports in the Skytrax list were privately owned, and the majority of US airports aren’t. Investing in infrastructure is a long-term business. Whether it is a toll road or railway, the private financing of these assets typically last up to 25 years. It’s why infrastructure assets appeal so much to institutional investors like pension funds, which are on the hunt for stable long term returns that they can match to their liabilities. Investors in toll roads, for example, base their investment on predicted traffic flows over the period of concession, which normally ranges between 10 and 25 years. However, disruptive technologies like driverless cars mean that infrastructure can no longer offer a clear visibility of revenues for the next five years, let alone the next quarter of a century. Richard Holman, head of GM’s foresight and trends unit, has predicted that autonomous vehicles will be available to buy as early as 2020, if not sooner. Google’s driverless cars, meanwhile, have already passed 2 million miles of driving on US roads. With the potential for driverless vehicles to be available “on-demand” via apps like Uber, car ownership is predicted to drop by as much as 43%. Add to this the growing popularity of car-sharing – typified by apps such as Lyft, into which GM has invested $500 million - and it looks highly likely that number of cars on our roads will decrease dramatically. This not only has an impact on toll roads, which are directly dependent on traffic levels for their revenues, but also for car park financings and those privately financed roads that earn their revenues indirectly via payments from public bodies. Availability-based financings, so-called because a private concession company is paid by government to keep the road open and available, would certainly be more insulated from the initial shock of a shift to driverless vehicles. However, they would be unable to remain totally immune from driverless cars’ effects on vehicle ownership levels, and from the shift to electricity from fossil fuels. In many countries, public funding for roads infrastructure often comes via a variety of taxes related to vehicle ownership: taxes on vehicle purchases, taxes on road use, and taxes on fuel. As ownership of fossil fuel-based vehicles plummets, so too will the tax receipts used to provide public funding for roads. The potential for new technology to disrupt the infrastructure investment market means that investors and fund managers need to take a new approach to how they assess and manage their assets. The good news is that this evolution isn’t necessarily all bad news for roads investment. Firstly, while driverless cars may reduce traffic levels, they will not remove the need for roads. And with a potential fall in tax revenues to support public funding of road infrastructure, it will fall to private investors to plug the gap. Equally, rather than mere strips of tarmac with toll booths, roads are likely to become far more complex assets. The need for local road information in addition to a car’s onboard computer has also been highlighted by Duke University’s Dr Henry Petroski. He points out that while general rules of the road may be able to be pre-programmed into vehicles, local customs like allowing trucks to double park while making deliveries will need to be conveyed to vehicles to avoid them misinterpreting the stopped truck as a traffic jam. More sophisticated road infrastructure will require highly skilled asset management expertise, potentially increasing the value that infrastructure investors and fund managers can bring to the roads sector. Attitudes to what is important in an investment are changing. Or, to put it more specifically, investors’ opinions on what constitutes investment risk are changing. In 2015 Bank of England Governor Mark Carney called the impact of humanity-induced climate change a “mega risk”. For infrastructure investors and their fund managers, the risk of climate change comes in many guises. It can, in limited circumstances, prove a threat to existing assets through extreme weather events. However, it is more likely to come in an indirect form: an ever-growing number of investors are concerned about climate change and are factoring an asset’s impact (be it positive or negative) on global warming into their investment decisions. According to US Trust’s Insights on Wealth and Worth Survey 51% of Baby Boomers – the generation currently holding the big wall of investment cash – believe environmental and social factors play an important role in investment decisions. This figure, recorded in 2016, was up 5% on just two years earlier. With the key stakeholders of institutional investors like pension funds becoming increasingly concerned, it is little surprise that more and more money is flowing into assets such as renewable energy and sustainable transport. 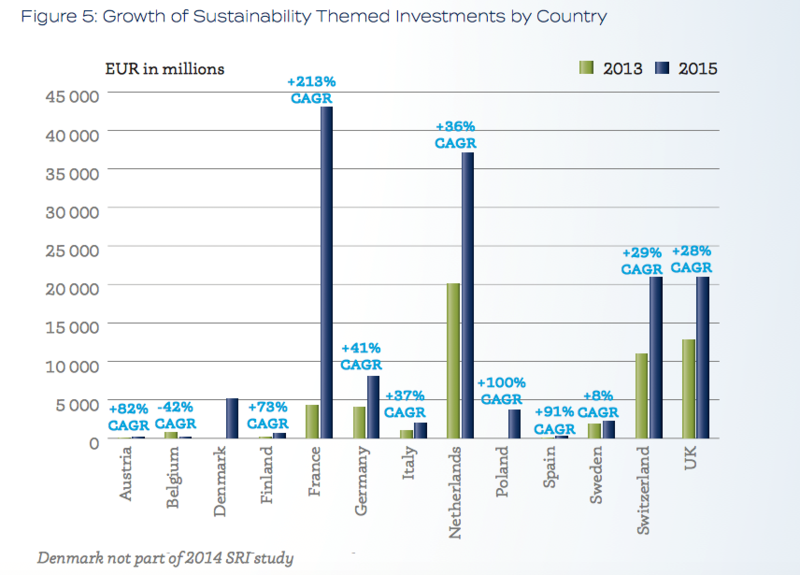 Even in countries starting from a stronger base, such as the Netherlands and the UK, sustainable investments still grew by 36% and 28% respectively, in just two years. Twelve months after his climate change statement in London, Governor Carney returned to the issue of climate finance in Berlin, asserting that “with investment in long-term infrastructure assets needing to quadruple, green finance cannot conceivably remain a niche interest”. Nowhere is this drive towards clean energy investments “going mainstream” seen more clearly than in Silicon Valley, where Google’s goal to source 100% of its electricity from renewables has so far seen the company sign power purchase agreements (PPAs), mostly with windfarms, totaling 2.6GW. Companies like Amazon, Microsoft and Facebook are, meanwhile, responsible for more than 2GW of signed PPAs in the US. And it is the generation that has grown up with the likes of Facebook as household names that look likely to vote with their cash, and force an emphasis on investments with strong environmental and social governance (ESG) profiles. While the importance of factors other than financial returns, such as social and environmental impact, is increasing across all age groups of investors, it is most apparent among millennials – loosely defined as the generation born in the early 1980s through to the early 2000s. According to US Trust’s Insights on Wealth and Worth Survey, 93% of millennials believe that social or environmental factors play an important role in investment decisions, compared to just 51% of Baby Boomers. With the millennial generation set to experience the biggest transfer of wealth ever in history – US $30 trillion – investments with ESG profiles may prove to be the growth financial sector of this century. The big criticism that’s always aimed at renewable technologies like wind and solar power is their variability. When the wind doesn’t blow or the sun doesn’t shine, these assets don’t generate electricity, which makes them an unreliable source of power generation. The facility is just one of several already running, or soon to be launched, in California that, in total, will be able to store enough electricity to equal a generating capacity of 77.5MW. Tesla and Southern California Edison’s facility in Ontario, California, comprises 396 of Tesla’s Powerpack units.Tesla’s Powerpack units. These batteries are developed and produced alongside the carmaker’s vehicle batteries and home Powerwall storage units at its Gigafactory facility in Nevada. Developed with Panasonic and officially opened last summer, the Gigafactory looks set to be the first of many such facilities. The company told its investors in February that it is considering building five Gigafactories. Other car manufacturers are also moving into the energy storage space. Nissan has joined forces with power management specialist Eaton to develop XStorage, a portfolio of energy storage solutions ranging from household battery units through to grid-scale storage. And in Europe, two former Tesla executives announced in March their plans to build a $4 billion battery manufacturing facility in Sweden, called North Volt. As economies of scale improve, the cost of lithium-ion batteries will come down. The North Volt executives want to bring the price down to below $100 per kWh – pushing the technology closer to becoming an affordable solution. Against the backdrop of rapidly advancing battery technology, 2015 marked a global tipping point for energy investment. For the first time ever, more money was invested in new renewable electricity generation than in new fossil fuel-based power plants. The tipping point has come about due to falling capital costs and the increased efficiency of renewables technology. In addition, there has been an increasing acceptance among investors that renewables projects are an important part of a core infrastructure portfolio. The days where investors might be put off by political risks such as the retroactive tariff cuts seen in Europe just under a decade ago appear to be long gone. Indeed, the anti-renewables rhetoric of US president Donald Trump has so far done little to dampen investors’ appetite for these assets. Investors have become comfortable with renewable energy technology and the long term revenues they secure via contracts such as power purchase agreements, which make them highly attractive in a competitive infrastructure investment market. This trend is likely to continue, even if subsidies such as the US Production Tax Credit (PTC) are eventually withdrawn. Macquarie estimates that, by the early part of the next decade, unsubsidised wind will be more competitive than a combined cycle gas turbine plant in the US. The challenge with these schemes is to package up enough rooftop solar panels to achieve a scale large enough to be attractive to investors looking for large ticket sizes, such as pension funds. However, intrepid fund managers have begun doing just that, and the development of cost-effective battery technology only makes these assets more desirable. A report by Australia’s Alternative Technology Association late last year concluded that a 100% electricity market will be entirely feasible thanks to the tumbling costs of household and grid-level batteries. Scotland is already targeting 100% renewables. In an infrastructure investment market often constrained by lack of assets, renewables energy is providing a bulging pipeline of projects. That pipeline will only swell further as battery technology becomes more established, and infrastructure investors are ready and willing to take up the investment challenge. If you have more than a passing interest in cycling, there’s a good chance you have heard of, or event used, the app Strava. Strava connects with smartphones and GPS cycling computers to record cyclists’ journeys, recording everything from distance covered and speed through to heart rate and calories burned. Hugely popular with competitive amateurs and professional cyclists alike, the app ranks athletes’ performance across various “segments” – short stretches of roads, such as hill climbs or descents – with the fastest rider declared “King of the Mountain”. As Strava users ride, they create a heatmap of their journeys which, when aggregated, provide a rich resource on how cyclists use the roads. Strava is now making this data available to urban planners via its spinoff Strava Metro. The company is working with cities across the globe to help with the planning of roads and cycling infrastructure. In the US city of Seattle, for example, planners combined Strava Metro data with their own manual bike count statistics to accurately model the numbers of cyclists likely to use new bike lanes planned for the city centre. Strava is just one example of how the data generated by the general public can be used to plan urban infrastructure. There are countless others, such Transport for London’s use of data to understand how disabled people use the London Underground , and taxi app Uber sharing anonymous trip data with the US city of Boston to help the city ease congestion. User-generated data is just the latest addition to the huge stream of data available to those operating and maintaining infrastructure assets. From basic safety devices such as temperature sensors through to condition monitoring and remote control of assets, there is a wealth of data at owner-operators’ disposal. This will only increase with the growth of the Internet of Things (IoT) and will affect every sector of infrastructure investment: transport, energy, water, waste and even social infrastructure such as schools and prisons. The potential for both making the most of existing assets and accurately planning new infrastructure is such that University College London professor of planning Michael Batty describes Big Data as “the new oil powering the future economy of cities”. There are of course some major hurdles that need to be cleared before Big Data can play a transformative role in the way cities and their infrastructure are planned, built and operated. At present, different operators within a city – or even within a single infrastructure asset like an airport - collect their own data and maybe be unwilling to share it, regarding it as proprietary. This creates a problem of transparency of data, making it difficult to fully utilise the information that can optimise assets. Related to this are the conflicts that can occur when different stakeholders have different goals. For example, within an airport flight operators may want passengers with connecting flights to move through the airport as quickly as possible, while retailers would prefer them to have more time to shop in their stores. Finally, there are regulatory constraints related to the sharing of data and privacy laws. This is likely to be most keenly felt in social infrastructure assets like schools and hospitals, where disclosing information on movement of patients or pupils could raise legal challenges. Even within the less controversial area of traffic flows, Uber, prior to its work with Boston, had refused to release data to New York City and the state of California over privacy concerns. Perhaps the most promising development for infrastructure investing is what could happen when all of this Big Data generated by assets and their users collides with new automated financial technology (Fintech). Fintech represents a massive challenge to the status quo. Indeed, bestselling author Yuval Noah Harari will use his keynote address at the Infrastructure Investor Global Summit to argue that algorithms “already know what you are going to do next” and that machines “won’t need an investment committee” for allocations of funds to be approved. A future driven by data is no fantasy; Fintech like Blockchain is already tearing up the financial transactions rulebook. Blockchain is a globally distributed ledger running on millions of devices, capable of recording anything of value. Originally developed as the technology supporting cryptocurrencies like BitCoin, Blockchain comprises a series of “blocks” of information that are timestamped and unchangeable – with each new block linked to the last in a chain that provides complete transparency on the history of transactions. Wikinomics author Don Tapscott describes Blockchain in his TED talk as representing the first time in human history that “people everywhere can trust each other and transact peer to peer”. “And trust is established, not by some big institution, but by collaboration, by cryptography and by some clever code,” he says. It is not inconceivable that there might be a future where, for example, pension funds are no longer run by fund managers, but by algorithms that seek out assets that match the funds’ investment criteria. IoT-connected infrastructure assets seeking new investment could release performance data that is quickly found by investors’ algorithms. Those looking to build new assets could release related user-generated data such as traffic flows, demonstrating demand for the new asset. All legal processes such as contracts and due diligence would be automatically delivered through a Blockchain, and revenues could be distributed directly and instantaneously. Apps not only have the potential to transform the physical infrastructure of our cities; they have the potential to radically disrupt the economies that underpin them too. Are investors ignoring the cyber security threat to infrastructure? From the alleged hacking of the US presidential election to the mass-release of sporting stars’ doping records, 2016 was a year when cybercrime hit the headlines like never before. For those working in the financial sector, a particularly alarming development was the attack on the Russian central bank and Russian commercial banks that saw hackers steal $31 million. Critical infrastructure is regularly cited as being a prime target in state-sponsored cyber warfare: former US National Security Agency chief Keith Alexander has warnedthat the greatest cybersecurity risk is a catastrophic attack on energy infrastructure. This followed an equally stark warning by current NSA chief Michael Rogers in 2014 that a major attack on critical infrastructure was likely in the next decade. And a survey by the Wall Street Journalof IT executives in the US, UK, France and Germany in 2015 found that 48 percent said it was likely there would be a cyber attack on critical infrastructure in the next three years that would result in the loss of life. The most significant cyber-attack in recent years was the hacking of the power grid in the Ivano-Frankivsk region in Ukraine in December 2015, which left the entire area in the dark for six hours. It was allegedly carried out by Russian hackers, who targeted the power plant’s supervisory control and data acquisition system (SCADA). SCADA systems are computer software programmes that gather and analyse the operating data of heavy plant and machinery, and can be used to control infrastructure assets. Prior to the Ivano-Frankivsk hacking, attacks of this type had already occurred in the UK, Italy and Malta. A report by Dell estimates that these types of cyber-assaults doubled in 2014 to more than 160,000. Infrastructure in developed nations is particularly vulnerable to sophisticated cyber attacks as much of it is ageing, according to Lord Jonathan Evans, the former director general of the British Security Service. Speaking at last year’s Infrastructure Investor Global Summit in Berlin, Lord Evans said that retrofitting IT systems to take into account cyber risks that did not exist when they were first designed would be a costly and complex endeavour. Despite the very real threat of cyber-attacks on infrastructure assets, progress on defending assets can be described as patchy at best. Speaking more broadly about the corporate sector in general, Lord Evans claimed the implementation of plans to combat cybersecurity lagged behind companies’ stated ambitions. asked for a show of hands to answer the question “How many of you incentivise cybersecurity plans through chief executive KPIs?”, none of the delegates raised their hands. This lack of preparedness has been perhaps most alarmingly highlighted in the nuclear sector, where think-tank the Nuclear Threat Initiative (NTI) claims that many countries do not yet have the laws and regulations needed to provide effective cybersecurity. The NTI’s 2016 Nuclear Security Index found that of the 24 countries with weapons-usable nuclear materials, 7 scored 0 for cybersecurity, while of the 23 countries that have nuclear facilities but no weapons-usable nuclear materials, 13 scored 0. While alarming, there are some positive signs that attitudes are changing – if not specifically within infrastructure investment, then at least more broadly in the corporate sector. KPMG’s 2016 Global CEO Outlook, which interviewed more than 1,300 CEOs of the world’s leading companies, found cybersecurity to be the risk that business leaders were most concerned about. This was a considerable jump from just one year earlier, where cybersecurity had been ranked as only the fifth most important concern for CEOs. There are also signs that complacency is giving way to a growing realisation that companies are not as prepared as they thought they were: 72 percent of CEOs say they are not fully prepared for a cyber event, up from 50 percent in 2016. When Donald Trump swept to power in the US presidential elections, he did so by promising to “Make America Great Again”. This slogan tapped into the popular belief among many Americans that globalisation had left them worse off and that it was time to put “America First”. Similar rhetoric was successfully employed by the campaign for Britain to leave the European Union, which repeatedly called on voters to “take back control” of their country by backing Brexit. Populist backlash against a perceived “global elite” is now occurring across Europe, most notably in France and the Netherlands where nationalist politicians are making significant gains. This battle between national values and global values can have a profound impact on infrastructure investment and development. At the most basic level, where countries such as the US and UK seek to restrict levels of immigrant labour, this can lead to skills shortages that limit a country’s ability to deliver all of the projects in its pipeline. More than 100,000 construction workers from elsewhere in the EU were working in the UK in 2014, according to the National Institute of Economic and Social Research. They were a significant part of a 2.1 million-strong construction workforce. In London, more than half of construction workers were from outside the UK. In a joint letter to the UK Government, representatives from across the construction industry warned that the country would be unable to deliver major infrastructure projects if the sector’s workers were not protected from an anticipated clampdown on EU migrant labour. A rise in nationalism also tends to go hand in hand with protectionist trade policies. This is being seen most clearly in the US, where the Republican Congress is seeking to pass border adjustment rules that would shift taxation on products from the country where they are manufactured to the country where they are sold. Aimed at boosting exports and reducing the US’ trade deficit, the policy will push up the price of imports. This will impact those infrastructure projects particularly reliant on imported technology, such as renewables. For example, although there are more than 500 wind turbine factories in the US, the majority of components that these factories assemble are imported. In 2015, these imports were worth $2 billion according to the Department of Energy Wind Market Technologies report. Any rise in project costs from the proposed border adjustment changes may mean that less profitable schemes do not get built. While the nationalist and protectionist elements of populism do pose a threat to the development of infrastructure, overall the sector may well end up being a beneficiary from the rise of populism. KPMG’s report Emerging Trends in Infrastructure 2017 identifies how in many countries – from Canada to Columbia to Asia – infrastructure is being used to underpin political promises for greater economic prosperity. The most famous example is Donald Trump’s promise to invest up to $1 trillion in renewing US infrastructure like roads and bridges. AFor infrastructure investors, this represents a huge opportunity. With a Republican Congress resistant to any new federal spending, it is predicted that Trump will seek private investment to fund his infrastructure plan, possibly leading to a proliferation of toll roads across the States. While border adjustment seeks to penalise imports of goods, it seems unlikely that that there will be any similar sort of move to limit foreign direct investment (FDI). Globally FDI grew by 38% in 2015 to $1.8 trillion, with the US by far the biggest beneficiary at $380 billion. Indeed, those speaking at an Infrastructure Investor roundtable in Septemberwere confident that a rise in populism and some protectionist measures would fail to have any meaningful impact on the global flow of capital. M&G Real Estate chief investment officer Tony Brown described the trend towards global investment as “unrelenting”, and Hermes Investment Management infrastructure partner Hamish de Run said that in the case of the UK, its only likely way of successfully surviving Brexit would be to make itself more open to foreign investment, not less. “UK infrastructure needs £200 billion over the next ten years, and with its fragmented pension system and a savings rate of one or two per cent, unless there’s a step change in the way we save in this country, the funding will need to come from elsewhere,” said De Run. Perhaps the best example of protectionist political sentiment having little impact on FDI can be found in India. While the country’s right-wing nationalist government has used foreign funding rules to crack down on charities and NGOs ranging from Greenpeace to Christian groups, , it has moved in the other direction when it comes to FDI in infrastructure. Last year India removed all restrictions on full foreign ownership of its airports, as part of a wider liberalisation drive aimed at increasing the levels of external investment and modernising the country’s infrastructure. Donald Trump may well want to build a wall, but when it comes to infrastructure it seems the only wall politicians are really interested in is attracting a wall of cash from private investors.